Rescue Mission to Ama Dablam (6812m) Proves Fatal for Fishtail Air’s AS 350 B3 (Call Sign:9N-AIX) – Summit Helicopters Pvt. Ltd.
Kathmandu (8th November, 2010): We deeply regret to inform you that our helicopter AS 350 B3 (Call Sign: 9N-AIX) met with an unfortunate accident at the Base Camp of Mount Ama Dablam (6812m) in the Khumbu Region while on a rescue mission. The unfortunate crash occurred on 7th November 2010 at around 9:30 AM (local time) when the helicopter flown by Late Captain Sabin Basnyat and accompanied by technician Late Purna Awale, were returning to rescue Mr. Kazuya Hiraide, a Japanese climber after having safely rescued German climber Mr. Danial Gottler. On this second mission, the aircraft met with an accident where both pilot and technician lost their lives. After the crash occurred, Fishtail Air deployed another AS350B3 Equiriel (Call Sign: 9N-AJI) helicopter to continue the rescue mission. In the early hours of 8th November Captain Ashish Sherchan & Captain Siddhartha Jung Gurung conducted the rescue mission and rescued Mr. Kazuya Hiraide. They also dropped a team of mountain guides at the crash site. They team recovered the dead bodies of the deceased which were flown back to Kathmandu on two helicopters of Fishtail Air. 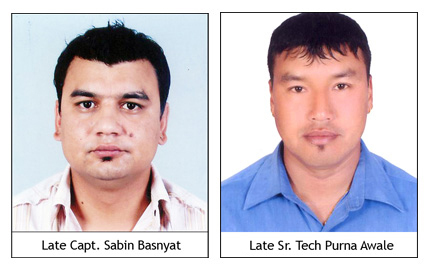 With the untimely demise of Late Captain Sabin Basnyat and senior technician Late Purna Awale, Fishtail Air as well as the Nepalese aviation fraternity have lost two very experienced and skilled experts. Their loss is deeply felt and they will be dearly missed by all of us at Fishtail Air. They Are the Great person For us and may their soul Rest in peace.